Looking for Fun this 4th? Check Out These Events Around Town! Lots to celebrate this Fourth of July so head out to one of these great festivals and enjoy the community and the holiday! Dads do it all and then some! So what is the best way to show appreciation this Father's Day? Here are a couple of ideas that Dad will love! Dad Jokes - Punny jokes must be in a dad's DNA. Add to your dad's collection by sharing some good finds from Internet sites made to celebrate this dad oddity. Gear - Got a tech-loving dad? The latest gear - or accessories for his newest tech toy - is always appreciated. Get it personalized for a special touch! Alone Time - Just like overworked moms, dads can crave time alone. Carve out a weekend to let dad have the house to himself or plan a quick and quiet trip and handle all the details so he can just set up camp and be lazy with no one watching! Hobbyist Gifts - Wood working? Sports watching? Music playing? Whatever your dad's hobby, a gift meant to increase enjoyment or make it easier will mean a lot. Put Your Feet Up - In some cases, dad's comfy chair isn't so comfy anymore. And while change can be hard, a fancy new chair will make dad's eyes light up. Beyond Brunch: 5 Ideas for Mother's Day Fun! Spending time with Mom is the best gift she could ask for on this coming Mother's Day. So if you're looking for something a bit different to do with Mom this year, check out these great alternatives to brunch happening around town! Laumeier Art Fair - If Mom loves art, the Laumeier Sculpture Park's Art Fair is sure to please! Eckert's Strawberry Festival - Fun for the whole family with rides and attractions! Bike the Katy Trail & Visit Wineries - Bicycling, nature and wine is a combination any Mom will love! Grant's Farm - Interacting with animals is a great option for families with small children. Free Mother's Day Yoga in St. Peters - For those fitness-minded Moms! It can be hard to refrain from spending your refund on fun things you don't really need, but consider it as a handover of money the government has been saving for you for the last year. 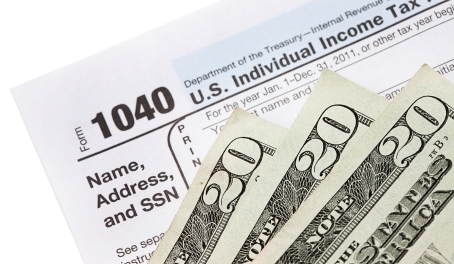 If you haven't yet spent your tax refund (Reminder: Deadline for filing is Tuesday, April 17th! ), consider these ideas for reinvesting that money into your home. Upgrade old or inefficient appliances. That 20 year old dryer is costing you more money than it's saving you by not replacing it. Upgrading inefficient appliances will undoubtedly make your life easier, your home more comfortable and save you on energy costs - a triple win! Get started on that home improvement project you've been considering. Regular monthly expenses often take precedence over buying paint for that bedroom with the ugly wall color or replacing the dilapidated mailbox. Using your tax refund to pay for these types of small - or larger - home improvements is a great reinvestment that often increase the value of your home. Enhance your landscaping. Landscaping plants and labor is an expensive endeavor and is often far down on the priority list. Your home's curb appeal is its first impression and investing in it is always a great idea. Take a chore off your plate. If your hard is hilly or your lawnmower outdated, consider hiring a lawn care firm to take care of it for you for a year. The extra time it buys you will pay for itself in no time and your neighbors will envy how good your lawn looks! Pay more on your mortgage. Paying even $100 more per month on your mortgage can significantly reduce the time it takes to pay it off and the amount of interest you'll pay. Start a rainy day fund. Many Americans don't have adequate savings and if this is you, consider starting a rainy day fund with your tax refund. You should have between 9-12 months of expenses socked away in case something happens and you can't work. These 6 Home Maintenance Tasks for Daylight Saving Time will Spring You Ahead! Time to "spring ahead" on Sunday - are you ready? Daylight Saving Time is a great biannual reminder to perform regular maintenance and cleaning of your home's systems. These six things are simple, inexpensive and will give you untold peace of mind that your home is safe and comfortable! Test Safety Equipment - Push the test button on all of your home's smoke alarms to make sure the batteries and the units are functioning correctly. As a reminder, the National Fire Protection Association suggests having a smoke detector outside every sleeping area, in every bedroom and on every level (including the basement). Also test your carbon monoxide detector and check the expiration date on your fire extinguishers. Clean Carpets and Rugs - Rent or buy a machine that deep cleans carpets and bring rugs in high-traffic areas to professional cleaners. Manufacturers suggest deep cleaning at least once per year so the spring cleaning time is perfect! The Big Dust - Each time the clock jumps ahead or falls back is a good time to dust the areas and items that don't get regularly dusted: baseboards, light fixtures and bulbs and other nooks and crannies that often get overlooked. Start up high and work your way to the floor for a most effective deep dusting. Clean Appliances - It might seem counterintuitive, but your dishwasher and washing machine both need to be cleaned at least once per year. There are several step-by-step guides to easily and effectively washing each appliance, but start with this one for the dishwasher and this one for the washing machine. Wash Your Pillows - All you need are two tennis balls to make washing your pillows a simple task that leaves them plump and refreshed. Wash two pillows at a time on the delicate cycle and then throw the two tennis balls in the dryer along with a dryer sheet. Just twice a year keeps you sleeping easy! Clean Out the Cabinets - It's normal for certain oft-used cabinets to end up in disarray over time. Tupperware, the medicine cabinet, linen closet, even the spice rack can get dirty with debris and expired items. When the clock jumps ahead and hour, go through those hectic cabinets with a tidy eye. Repeat and referral customers are the lifeblood of any business. And just as you wouldn't only show your spouse or partner love on Valentine's Day, you should consider how to show your customers appreciation all year long. These tips are cost-effective and genuine ways to keep you top of mind and prove how much you value your customer's business throughout the year. Reward Loyalty - Loyalty programs are great but they can be cumbersome, hard to manage and time consuming for little payback. But you don't have to be fancy about it! Simple things like a hand-written card in the mail or a flower/fruit arrangement can really show your appreciation for someone coming back to you with their business. Make the reward commensurate with the size of the sale or business they're bringing you. People don't forget when they're thanked for being loyal! Be Generous with Praise - One of the easiest ways to show your appreciation is using social media. Calling out a customer with thanks for their business will net you more followers and encourage engagement which leads to more exposure for you. Engage Genuinely - Involve customers and clients in your decision-making and actively listen when you're getting feedback. People want to be heard and if they see you listening intently, they'll be more inclined to work with you in the future. Be Flexible - Just because you've always done something a certain way doesn't mean there isn't value to changing things up on request. Your client will appreciate your flexibility and willingness to meet their needs and be more likely to use your service the next time they need it - and they'll tell their friends about how you bent over backwards for them. Incentivize Referrals - Again, simple is best when it comes to expanding your customer base with referral business. The simplest way to gain referrals is to ask for them. And when someone agrees or comes through with a referral, go back to tips #1 & #2 above! Focus on the Experience - Each time you interact with a customer or client, you're forming experiential knowledge and history with them. Those experiences will determine whether they want to use your service again so always keep this in mind with any knew client or potential client. Resolutions to practice better habits in our homes can be just as beneficial as those resolutions focused on our person. Whether your main objective is to save money, make improvements or just enjoy your home more, these six suggestions are easy to implement and will provide tangible results for your most valuable asset: your home! Replace CFL and incandescent bulbs with LEDs. The price of LED bulbs has come way down in the last couple of years and the energy savings will more than cover the cost of replacing all the bulbs in your house. In addition, LEDs last 3x longer than the average compact fluorescent bulb and don't contain mercury, an element toxic to humans. Start saving now for major repairs. If you don't already have a fund set aside for replacing the roof, the furnace, the dishwasher or any other big-ticket piece of your house that is nearing the end of its useful life, start saving NOW. The average cost of home upkeep in a year is around $3300 and goes up with the size of the house. If you know your hot water heater is 10 years old, you'll be much less distressed when it dies. Improve your home's safety in two steps. Installing a carbon monoxide detector and getting a radon test kit will do two things quickly: let you know if the air in your home is safe for your family and give you peace of mind that the invisible threats are mitigated. Get to know your neighbors. Whether you join a local volunteer organization, sign up to the neighborhood watch or just walk over to a neighbors' house and introduce yourself, being involved in the community around you provides ample benefits. From having a place to go in an emergency to knowing about potential threats, knowing your neighbors is a step in the right direction. Share home improvement projects with your family. Kids don't have to be just another thing to work around when you're tackling a home improvement project - they can be vital helpers! It makes them feel valuable and you get to spend quality time with them that doesn't involve a gadget. Find ways to get them involved, from picking out paint colors (within reason!) to learning how to think Safety First! Get organized. No list of home considerations is complete without the ubiquitous calls to declutter. But it works! Clutter has been shown to make people feel uncomfortable and anxious, and as the year goes on, more and more "stuff" accumulates. It doesn't have to be a huge task either: pick one room a week and before you know it, your clutter-free home will have you all smiles! The holidays are supposed to be a time of joy, making family memories and reminding ourselves about what is really important in life. But sometimes, the pressure to have just the right gift for everyone and the sheer madness in stores and on the roads can make it hard to focus on the goal and in some cases, causes high stress levels. Before you buy another gift or make another trip to a store, read these tips to avoid the frustration and get back to spreading holiday cheer! Find inspiration online - If you're trying to keep local stores in mind when shopping this Christmas, you can still get a lot of help from browsing the Internet. Having solid ideas for each gift recipient can come from many places, but if you get stuck, check out gift buying guides on sites like UncommonGoods.com or just Google "gift guides" for over 12 million results in less than half a second. Make a list and do some research - It seems obvious but how many times have you had a great idea for someone, only to forget it later? We love the AnyList app because the list is at hand any time during the year so whenever inspiration strikes, its immediately noted in the "Christmas Gift Ideas" list that's sorted by giftee. Consider a gift of an experience - Everyone has that person who stumps you when it comes to giving gifts. Maybe they say they don't want anything or they already have everything. One thing everyone needs is time. Whether it's time spent with family using a Groupon for a movie night or a spa gift card for that person that doesn't normally take time for themselves, giving the gift of time is giving that person an experience that they'll remember. What better gift than that?! Shop on off hours - With just under two weeks to go, just accept that stores will be a little busier than normal and get down to business. If you have an extra vacation day laying around, now is a great time to use it to shop during the day when crowds are generally lighter. Caveat: every place is crazy busy all day December 23rd and 24th. If you've waited that long, you might actually enjoy the crowds and the pressure of last-minute shopping! Pace yourself - Even though time is getting tight right about now, you can still make it easier on yourself by spreading out the gift buying, especially if you're not one to have a lot of stamina for shopping. Start with gifts you know you need to purchase online (and get a move on unless you want to pay for expedited shipping!) and move on to those you'll buy locally. This is where that list and the research you did really come in handy! 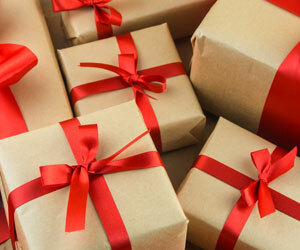 Let the stores do the wrapping - A major perk of shopping at brick and mortar stores is the perk of free gift wrapping. Trust me when I say it's worth it! Literally everybody has a collection of something and chances are, it's sentimental. Too often, our collections are packed away and rarely seen but that doesn't have to be the case. With the following five ideas, you'll be able to pull that collection out of the attic and display it proudly as interesting home decor. Two words: Floating Shelves. These are your friend when it comes to displaying oddly shaped or large items...or a large collection of items. They come in a variety of finishes and sizes, can be easily acquired at big box stores and decor sites, aren't too difficult to install and make any collection cohesive and polished. Only downside: dusting required. Think smart about built-ins. If you're lucky enough to have built-in shelving, it's easy to go a bit overboard and pack them full of multiple small collections or a random hodgepodge of stuff you've collected over the years. If your collection is really big, pare it down to just the most prized members to allow plenty of space for each item to breathe and shine on its own. When a shelf is cluttered, the eye doesn't know where to land so it just bounces away to something else. Be creative about placement. Plates don't have to always go in the dining room or the kitchen. Plates can flank a mirror in a foyer or have prime placement above a window seat. Sometimes an unexpected location can give a collection more prominence, which enhances your enjoyment of it. Frame it. This one can be a bit more time consuming but what a difference it will make! Frames draw the eye in to the item inside it so they make a great option for displaying collectibles. Shadow boxes and floating box shelves also provide the same effect and really make each piece stand out. Group things by an interesting attribute. And by interesting, we don't mean color. That's been done a million times! By choosing an attribute that is unexpected - height, frame shape, texture as examples - the individual items become more in focus and the collection appears more cohesive. Is Job Satisfaction Important to You? It's Important to Us! Working hard at a job you love is a realtor's daily reality and we think we're lucky to be able to help people fulfill their dreams. But have you ever felt like your brokerage is limiting your success? Not giving you the tools you need or the return you deserve? At SRE, agents are supported as much or as little as they need and the commission caps are competitive and allow you to keep more of your hard earned commission in your pocket. Wouldn’t it be great to work with a brokerage that knows how to help you achieve even higher job satisfaction? And wouldn’t you rather keep more of your hard-earned commissions? If you are looking for a better arrangement for yourself and want more control over it, consider making a Smart Move to SRE. 40+ years of experience mingled with young voices to keep ideas fresh! Our Sales Manager is happy to arrange a confidential meeting so you can see for yourself how the SRE atmosphere attracts both experienced and newly-minted agents. Click here to take the first steps towards a Smart Career Move!